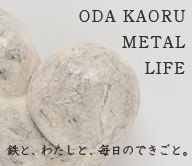 "ODA Kaoru Metal Works" is the official site of ODA Kaoru who creates contemporary art works by using metal. (C)2011-2018 ODA Kaoru. All Rights Reserved.